Many are self-explanatory and are merely there for internal administration purposes. Although the majority of statuses will not impact a trade mark applicant or general consumer, some will indicate what steps you might need to take. Three statuses indicate that a trade mark is registered or still able to be registered. Registered/Protected means that your trade mark is registered, and you have the exclusive right to use the mark in relation to the registered classes of goods and services. Trade mark registration in Australia lasts for ten years, so check the ‘Renewal Due’ label to see when your ten years expires. This label means that your trade mark is registered, and you have protection, but your ten years registration is about to expire. IP Australia usually gives a few months notification so that you can pay in advance. Remember to update your details and address of service if there are any changes, as all IP Australia correspondence will be sent the details they have on file. This status shows up if you have passed the renewal due date, and you have not paid the renewal fee. The trade mark is considered to be expired as the registration is no longer valid. But fear not – IP Australia allows you to renew still your trade mark (without having to go through the entire process again) up to six months from the date of expiry. You will need to pay the standard ten-year renewal fee, as well as an additional late fee per month that you are late. Once paid, your trade mark will be renewed and ‘Registered/Protected’. Before a trade mark is registered, there are a number of statuses that are used to keep track of where your application is up to in the examination process. These are usually the first statuses displayed with your trade mark and indicate that your trade mark’s details have been entered into the database. Indexing means that IP Australia has yet to approve the particulars, whereas Indexing Approved, means they have. IP Australia uses this status in situations where the trade mark applicant has requested expedited examination. ‘Taken for Examination’ means that the request was successful, and the examiner is examining the application. This is not an ideal status for your trade mark! It means that IP Australia has issued an adverse examiner’s report, and you will need to address the objections raised. You have 15 months from the date of issue of the first report in which to overcome these problems, so this status may remain for a while. If you haven’t been able to respond to the issues raised in the first report within 15 months, you may need to pay monthly extension fees to keep the application alive. The acceptance date is usually the date 15 months after IP Australia issue the first report. You can also request deferring the acceptance date so that you can attempt to resolve the matter. IP Australia uses this status to show your request’s success and that they have deferred the acceptance date. This status is used where the issues the first report contained are unresolved within 21 months, instead of 15. If a trade mark on ATMOSS shows this status, you are required to pay monthly extension fees as well provide reasons supporting the extension. 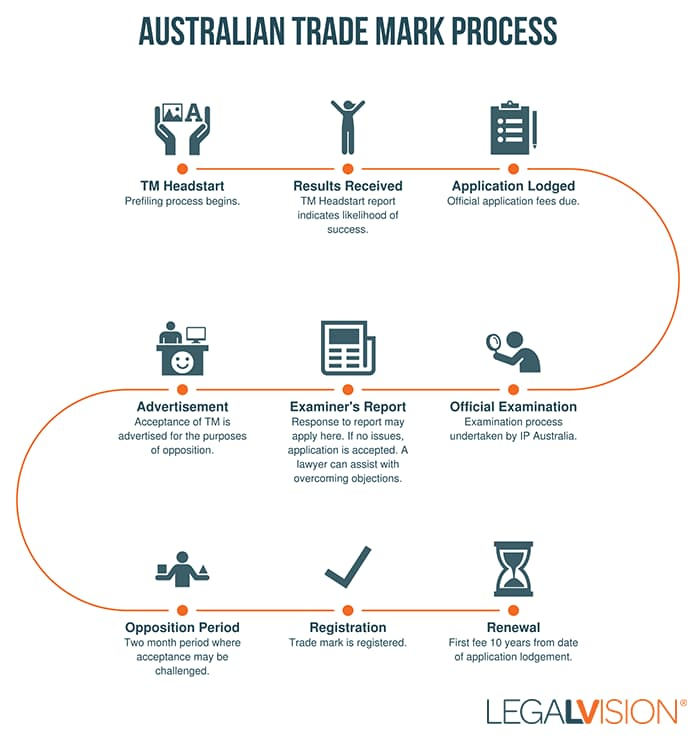 As a trade mark applicant, you can request a decision on the written record so that you can try to overcome the issues that IP Australia have raised regarding your application. This status still relates to adverse reports, where the applicant has requested a hearing to overcome the issues raised in the report. Good news! This means that IP Australia has accepted your trade mark – it can happen immediately after examination or after you have overcome objections raised in an adverse report. Accepted means that your trade mark is on track to registration (provided no-one lodges an objection during the opposition period and you pay your registration fees!). Uh oh! When a trade mark has this status, you know that even though IP Australia has accepted your trade mark, someone else has lodged an opposition. This could be a third party who owns a similar trade mark or does not believe you should have the registered trade mark. The next steps will require both sides provide submissions and evidence to IP Australia to show that the trade mark should or should not be registered. Awaiting advertisements occurs when IP Australia accepts your trade mark but still needs to publish the details in the Trade Marks Journal. Applications are usually advertised five months after the filing date, followed by a two month opposition period before registration. The period before advertising makes an allowance for trade marks that may be claiming a priority date from overseas countries. This is also great news for you! Your trade mark has been accepted, the opposition period is over, and you can register the trade mark! Make sure that you pay the registration fee within six months from the date the trade mark was advertised as accepted. ATMOSS will also show the registration due date. These statuses indicate that the trade mark never made it past the examination stage. ‘Refused’ is seen after a hearing, meaning that your trade mark application was refused during the hearing procedure. ‘Rejected’ means that the application could not be accepted. The applicant was given an opportunity to be heard and to overcome the objections, but an impasse was reached, and the Registrar ultimately rejected the application. The removed status applies to trade marks which have been registered at one point but are no longer on the trade marks register. Your trade mark will be removed from the trade marks register if you have not paid the renewal fees and the six month extension period has also passed. If you want to revive the trade mark, you will need to start the process all over again. If you have registered the mark but not used it for a continuous period of three years. Cancelled means that you, the applicant’, have decided to discontinue the registered trade mark. You can request that IP Australia cancels your trade mark. The following status related to accepted and unaccepted trade mark applications that were never formally entered on to the Register for various reasons. This means that the application was not accepted for registration, and the application is no longer valid. This usually happens once IP Australia issues an adverse report, the applicant may not have responded or responded in time. A typical trade mark status progression may be Under Examination, to Under Examination – Extension Fees Not Required to Under Examination – Extension Fees Required. If you do not pay the extension fees, the application will lapse. This is different from the ‘Refused’ and ‘Rejected’ statuses which formally and decisively conclude the matter and do not allow the trade mark to be registered. Your trade mark has been accepted, but the application has lapsed because you have not paid the registration fees. This status is okay if you have changed your mind about registering the trade mark, but is not ideal if you are still planning to use it. You will need to lodge a new application. This is not a common trade mark status. In the Trade Marks Act 1995, multi-class trade mark applications were not allowed, so applicants had to file a separate application for each class required. The Trade Marks Amendment Act 2006 allows owners of multiple registrations for the same mark to link the trade marks so that they are treated as one registration. There are a few requirements for this including that the marks had to be lodged on the same day for the same trade mark and it needed to be before January 1996. You can also request that IP Australia withdraws your trade mark application, and this must happen before registration. Now that you understand the various statuses, you will be able to use ATMOSS more effectively. Be aware of your trade mark rights as well as the rights of others. If someone tells you that they have a registered trade mark, you can easily confirm this on ATMOSS. Similarly, you should be careful before trying to enforce your trade mark rights in case your trade mark is not yet or no longer registered. Also, make sure that your address for service is always up to date so that you receive notice of any payments that may be due. As you can see, there are late fees or the risk of removal if you have not paid your fees. Questions about trade mark registration? Get in touch with our IP team on 1300 544 755.